If it weren’t for photography, who would record people living on the fringe of society, sometimes beyond what is considered the convention, other times simply rebelling against the society they live in? Words of course could record all of that, but in my opinion never quite as poignantly, and often as tenderly, as photographs do. This is aptly demonstrated in an exhibition currently at the Barbican Centre in London (running until 27 May). 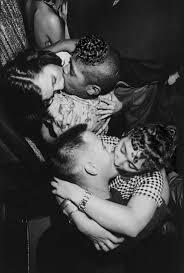 20 photographers from all over the world, spanning the period of the 1950’s to today have documented life on the fringe. The display of the photographs was much better than the usual show: each photographer has his or her own room and we meander from one room to the next as we would explore a haunted house. I do not mean that it is a frightening exhibition, but rather each room brings it own surprises. Some of my favourite photographers are exhibited: Daido Moriyama, Diane Arbus, Mary Ellen Mark, Bruce Davidson, Dayanita Singh and many more. Others were wonderful discoveries and some I had heard of but did not know much about their work. The exhibition has some unexpected surprises (eg Casa Susanna) but I do not want to spoil your visit. I will simply here mention the exhibit of the French photographer Philippe Chancel: you would be forgiven for believing that these are photographs of youths in the Southern states of the USA circa 1950’s, but they are in fact photographs taken in Paris in the 1980’s! Chancel photographed members of two gangs, the Vikings and the Panthers, who were standing out from the more common right-wing gangs of the time since they were made up of members from multiracial background. The Vikings did not have as much a political agenda as the Panthers and they named themselves after the American rock’n’roll group of the 1950’s the Del-Vikings who were the first such group to have both black and white musicians. The energy of the youths’ music and style clearly emanates from Chancel’s photographs. As luck would have it, I bumped into Chancel and his wife in the Barbican Kitchen after the exhibition and it was a real treat to discuss with him this exhibition and his current projects. I am afraid, no selfie! It did not even occur to me, as I was too interested in discussing photography, art and the light in London vs Paris with this remarkable photographer. Do go and see this exhibition; you won’t be disappointed.